Maybe I only think it wasn’t capitalized because when I sign in, I don’t capitalize it. I don't sign in. My account is a cognitive shadow designed for your amusement. Of course, there was the two accounts fiasco a while back, so mods have probably already checked my location. I never need to sign it, whenever I pull up the Shard I’m already logged in. just a male Aes Sedai, trying not to go mad. Unless I'm imagining things, it was lowercase. I kinda want to start saying this after every single post on this thread, no matter what it is. It would probably work, too. Oh, nevermind then. We’re all go- Wait! Nooooooooooooo!!!!! 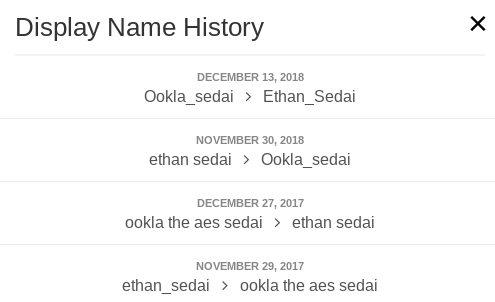 Well...I checked your display name history. It's been uppercase only since Ookla season.